This is lovely. Share these with those you love. A few years ago, I saw some hilarious Valentines based on dictators. And I thought, I should totally do that with famous theologians! (Because, you know, that’s how my brain works.) So here you go! 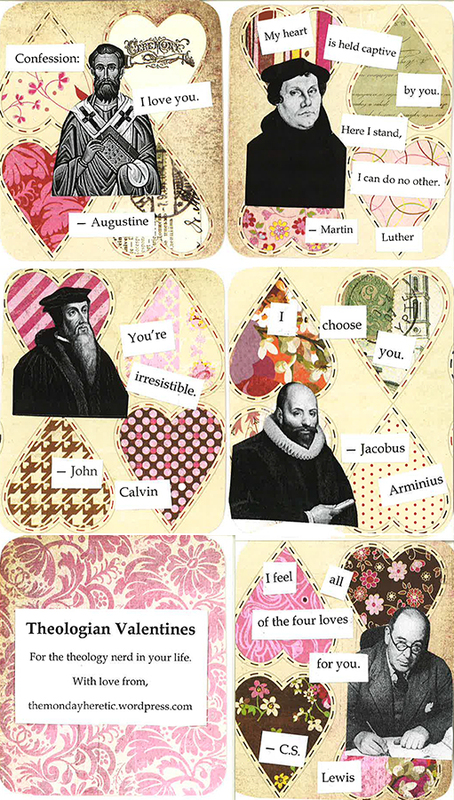 Also, if you don’t present the Calvin valentine with a bouquet of tulips, you are missing out on a prime pun opportunity. Just sayin’. Disclaimer: I have the greatest respect for all of these folks from church history and their contribution to the faith. I also think they might have found these amusing. Any alternate caption ideas or ideas for theologians who aren’t featured? Betsy, Greg, Liz, and Vivian talk about the Netflix series Master of None and where it intersects issues of phases of life, diversity, and vocation. On December 1, 2015, American Baptist Seminary of the West will participate in #GivingTuesday to encourage support for the seminary’s Seminary Fund. Retail stores all across America celebrate “Black Friday” and online retailers tout “Cyber Monday” we hope offer an opportunity for God’ people to leverage social media and to participate in a national movement dedicated to giving. Our goal is to use #GivingTuesday to raise $5000.00 to support our seminary fund. All donations made on #GivingTuesday will receive a portion of matching funds, and we’re even eligible for cash prizes to further this cause – so now’s the time to get involved! Please consider making a donation and sharing this campaign with your friends and family to help us reach our goal. Giving online is easy and fast, and your support will make a real difference. Originally posted here, these words are a good reminder for us all. In the midst of the fear mongering we can make a difference as the American Baptist community in simply being who Jesus calls us to be and extending compassion to those who have lost everything in the strife in the Middle East. We all look back and wonder how nations could have turned aside Jewish families seeking refuge as Hitler rose to power. May the same not be asked of us. In addition to being loved by Jesus, Leslie Bowling-Dyer is a mother, wife, daughter, neighbor, preacher, teacher, PhD student, bicycle commuter and wishes she was a good hip hop dancer. She is also an alumna of ABSW.